The aggregate market value of the voting stock held by non-affiliates of the registrant was $61,620.40 as of March 31, 2011, the last business day of the registrant’s most recently completed second fiscal quarter based on the closing price per share on such date of $0.2 . As of January 10, 2012, the registrant had 3,272,311 shares of its common stock outstanding. • other matters discussed in this Annual Report generally. Consequently, readers of this Annual Report should not rely upon these forward-looking statements as predictions of future events. New risk factors emerge from time to time and it is not possible for our management to predict all risk factors, nor can we assess the impact of all factors on our business or the extent to which any factor, or combination of factors, may cause actual results to differ materially from those contained in any forward-looking statements. We undertake no obligation to update or revise any forward-looking statement in this Annual Report to reflect any new events or any change in conditions or circumstances. All of the forward-looking statements in this Annual Report are expressly qualified by these cautionary statements. China Grand Resorts Inc. together with its subsidiaries (“CGND” the “Company,” “we,” “us,” or “our”) was incorporated in the state of Nevada on September 21, 1989 under the name Fulton Ventures, Inc. In June 2001, we acquired American Overseas Investment Co., Ltd. (“AOI”), a company incorporated in Macau, of the People’s Republic of China (“PRC” or “China”). With our acquisition of AOI, we began to focus our business on acquiring and developing companies with the goal of building a broad network of media, marketing and advertising companies in the People’s Republic of China (PRC). On September 19, 2002, we changed our name to Asia Premium Television Group, Inc. to more accurately reflect our business at the time. In July 2004, we completed the acquisition of 100% of Beijing Asia Hongzhi Advertising (“BAHA”), a company organized under the laws of the PRC, and its wholly-owned subsidiaries. In July 2004, we also completed the acquisition of 100% of BAHA’s another subsidiary, Beijing Hongzhi Century Advertising (“BHCA”), a company organized under the laws of the PRC. As a result of these transactions, we became engaged in advertising production, and media consultation providing marketing, brand management, advertising, media planning, public relations and direct marketing services to clients in the PRC. In September 2005, we sold our interest in AOI to an unaffiliated third party. In March 2007, we effected a 1,000 for 1 reverse stock split of our issued and outstanding common stock. In July 2007, the Company acquired 100% of Sun New Media Transaction Service Ltd. (“SNMTS”), a company incorporated in Hong Kong, and its wholly owned subsidiary China Focus Channel Development Co., Ltd (“CFCD”), a company incorporated in People’s Republic of China, from NextMart Inc. (OTB: NXMR) for limited consideration. On December 31, 2007, the Company entered into an agreement with Nanchang Hongcheng Mansion Limited, an unaffiliated company, to acquire a 70% equity interest in Jiangxi Hongcheng Tengyi Telecommunication Company, Ltd (“JXHC”), a local reseller of mobile minutes in Jiangxi Province. As consideration, we paid the seller RMB 2 million (approximately $282,486). On January 3, 2008, we entered into an agreement with Union Max Enterprises Ltd. (“Union Max”) to acquire a Provincial Class One Full Service Operator license for the Jiangxi Province, PRC. On that same date, we divested our traditional advertising business by entering into a sale and purchase agreement with Fanya Advertising Company Ltd. (“Fanya”) whereby we sold BAHA and its wholly-owned Chinese subsidiaries BHCA (“BAHA Group”). We sold the BAHA Group to Fanya for a total consideration of $4.8 million which was completed on January 10, 2008. Under the agreement with Union Max, we paid them the sum of $6 million, of which $4.5 million was paid in cash and $1.5 million was paid in the form of our common stock. As a result of that transaction, we acquired a Provincial Class One Full Service Operator license for the Jiangxi Province. Union Max was a subsidiary of China Mobile and Communications Association (“CMCA”). CMCA is China's leading association of telecommunications and telecommunication-related company. The acquisition was completed on March 31, 2008. In December 2008, the Board of Directors of the Company resolved to terminate the Company’s top up services in Jiangxi Province, and, on May 11, 2009, we entered into a share transfer agreement with an unaffiliated third party wherein we sold our ownership in JXHC for a total consideration of $100. The transaction was effective on March 31, 2009. On March 30, 2009, we completed an acquisition agreement with the shareholders of GlobStream Technology Inc. (“GlobStream”) to acquire 100% of GlobStream, a corporation incorporated in the Cayman Islands for $156,000. GlobStream was founded by Dr. Wenjun Luo, one of our previous directors, who had developed a unique mobile Internet software called Total Mobile Media. In May 2009, we terminated the operations related to GlobStream as the mobile phone multimedia and advertising businesses of Globstream were not performing well. Effective on August 1, 2009, as described below, the Company used the ownership in GlobStream to acquire from Beijing Hua Hui Hengye Investment Limited, the commercial income right as detailed below. On July 9, 2009, we entered into an agreement with Redrock Capital Venture Limited (“Redrock”), a BVI company. We agreed to issue a total of 92,683 shares of our common stock to Redrock in order to cancel the loan of $223,529 from Redrock. Ms. Yang Lan is the majority shareholder of Redrock. She is also the controlling shareholder of Her Village Limited, one of our largest shareholders as of such date. On August 1, 2009, the Company entered into a subscription and asset sale agreement (the “Agreement”) with Beijing Hua Hui Hengye Investment Ltd. (“Hua Hui”), an unaffiliated PRC company. Hua Hui is an affiliate of The Beijing Hua Hui Corporation, a PRC real estate construction and development conglomerate that specializes in constructing and developing travel, resort, hotel, and apartment properties in popular tourist and other destinations within the PRC. Under the Agreement, we received from Hua Hui the commercial income rights (described herein below) to 10,000 square meters to a 17 story apartment building in the Huadun Changde International Hotel’s Apartment Complex located in the city of Changde, Hunan Province (“Project”). The Project is currently under development by Hua Hui. In exchange, we agreed to issue to Hua Hui subject to certain conditions, a total of 2,774,392 shares of our common stock valued at $2.40 per share (the closing price of the Company’s common stock on the transaction date, August 1, 2009 after giving effect to the 20 for 1 reverse split) for a total stock value of $6,658,536, and transferred to Hua Hui certain other Company assets valued at approximately $658,241. These assets consisted of all of our shares of the GlobStream, certain assets of both SNMTS and CFCD, and other miscellaneous assets of ours. On September 8, 2009, we issued 832,318 shares of our common stock to Wise Gold Investment Ltd., a British Virgin Island company acting on behalf of Hua Hui. On that same date, we also issued 1,942,074 shares of common stock to Blossom Grow Holdings Limited, a British Virgin Island company, as escrow agent under an escrow agreement by and among us, the escrow agent and Hua Hui. The escrow agent will hold the escrow shares pending completion of the Project which is expected to occur at or near the end of calendar 2010. If the escrow agent receives written instructions from the Company that the Project is completed in accordance with the terms of the Agreement, the escrow agent will release the escrow shares to Hua Hui. However, if after projected completion date, the Project has not been completed, the escrow shares will continue to be held at escrow for one year. If after one year, the project still has not been completed, the Company and Hua Hui will negotiate an agreement to deal with the escrow shares. On December 5, 2011, the Company entered into a Supplemental Agreement with Hua Hui and Blossom Grow Holdings Limited, The escrow agent will hold the escrow shares depending completion of the Project which is expected to occur on or about August 31, 2012. If after August 31, 2012, the project still has not been completed, then the Company and Hua Hui will negotiate and reach an agreement to deal with the escrow shares. During the escrow period, Hua Hui will be able to vote such shares provided it has reached an agreement with us on such matter(s), otherwise, the escrow agent will not vote on such matter(s). As a result, Hua Hui and Mr. Menghua Liu, Hua Hui’s Chairman and sole shareholder and the Company’s Chairman and Chief Executive Officer, are deemed the beneficial owner of such shares. After giving effect to the transaction, Hua Hui became the Company’s majority shareholder and beneficially owns approximately 84.8% of the Company’s outstanding shares. Effective on November 16, 2009, we changed our name to China Grand Resorts Inc. to more accurately reflect our new business efforts and effected a 20 for 1 reverse split of our common stock. In December 2009, the Company incorporated Key Prosper Holdings Limited, a company incorporated in the British Virgin Islands on December 8, 2009, with 100% shareholdings. From 2004 through January 2008, as a result of our acquisitions of the BAHA and BHCA, we were engaged in advertising production, and media consultation providing marketing, brand management, advertising, media planning, public relations and direct marketing services in the People’s Republic of China. As disclosed above, we ceased those operations when we sold our interest in the BAHA Group in January 2008. In January 2008, our business focus was based on the interest acquisition in JXHC and the Provincial Class One Full Service Operator license for the Jiangxi Province from Union Max. We also subsequently acquired other mobile phone and internet based technologies to compliment our existing technology and license rights. We attempted to provide ancillary services for cell-phone customers in Jiangxi Province whereby customers could buy minutes on the fly using their debit card or bank account along with other mobile phone based services. However, in December 2008, due to third party issues which negatively affected our ability to launch that business, we determined to terminate that business which resulted in a sale of our interests to an unaffiliated third party effective in March 2009 for $100. On August 1, 2009, we entered into the agreement with Hua Hui described above. Under the agreement, we received the commercial income rights to the Project. In the PRC, local and central governments own all of the real property, however, land use right are granted by the governments to third parties. Hua Hui owns the land use rights to the Project, and we received the commercial income rights to the Project from Hua Hui. Commercial income rights means the exclusive right to own and/or receive any and all income and proceeds derived from the Project in any capacity. Hua Hui and its affiliates, including The Beijing Hua Hui Corporation, are a PRC real estate construction and development group that specializes in constructing and developing travel, resort, hotel, and apartment properties in popular tourist and other destinations within the PRC. As a result of the transaction with Hua Hui, we intended to become a leading specialty real estate consulting and marketing company for tourism projects in the PRC. Initially, our plan was to market the commercial rights to the Project that we received from Hua Hui. We further planned on expanding our business by using existing resources and knowhow of our affiliates and other parties to engage in providing consulting and marketing services for real estate developers. However, beginning in late 2009 and continuing through 2010, the PRC State Council adopted a number of initiatives designed to cool a perceived overheated real estate market. As a result, the Company has suspended its plans to engage in consulting and marketing services for real estate developers. Presently, apart from the Project (discussed below), it is evaluating other markets and business opportunities, including subject to market conditions its previously proposed real estate consulting business, however, as of the date of the report, it has not committed to any specific market or business opportunity. With respect to the Project, Hua Hui will be responsible for all project marketing and actual unit sales. We expect to pay Hua Hui a sales commission of not less than 0.5% and not more than 8% of the unit sales price and we will receive the remainder of the unit sales price. As of the date of this report, we do not have any formal agreements or arrangements with any developer or Hua Hui for fees that we will earn, or fees that we will pay Hua Hui. As mentioned above, the Project consists of 10,000 square meters of apartment space in the concerning Building of the Huadun Changde International Hotel’s Apartment Complex, a 17 story building, located in the city of Changde, Hunan Province (“Project”). The Project is currently under construction by Hua Hui. Changde is a popular tourist destination located in China’s central Hunan province. Upon completion, the Complex will consist of a total of 215,000 square meters located on an approximately 3.6 acre piece of land that has access roads on the North, East, and West. The city is accessible by rail and air and is in close proximity to several tourist, scenic, and commercial areas. The Project is in close proximity to several tourist, scenic, and commercial areas. Construction began on June 1, 2009 and initially was expected to be completed on December 31, 2010. However, due to change of decoration and style for improved quality and appearance, Hua Hui has informed us that the Project is expected to be completed during August 2012. All permits concerning the Project have been acquired from governmental authorities, and the construction of the Project is approximately 85% completed as of the date hereof. We also have acquired the pre-sale permits for the sale of the apartments from the local real estate authority. The Project when completed will be comprised of a total number of 128 apartments. The units are expected to range in size from 120 square meters to 210 square meters. Under current market conditions, we expect that the price of the apartment units to be approximately RMB4,000 ($629) per square meter, subject to market conditions. The units when sold will be unfurnished. Hua Hui began pre-completion marketing efforts in the mid-calendar 2010. In this regard, Hua Hui have initiated advertisements in the Changde airport, the Changde Evening paper and the Hunan Morning paper, Hua Hui also initiated advertisements in the Changde TV and the Changde broadcasting station. Hua Hui have initiated a text messaging program to potential buyers and posted advertisements on an outdoor billboard on the main street of Changde City. Finally, Hua Hui have printed sales brochures, hosted potential buyers and commenced website design for the Project. A sales center and several model units with respect to the Project were completed by Hua Hui in late November 2010. Potential buyers can tour these models to gain appreciation of the design, structure and appearance of the units. We have actively collaborated with Hua Hui with regard to the content of information contained in the outdoor billboard and print media, as well as the design of the sales center. In addition, we have commenced independent marketing efforts for the Project on a limited basis. We expect to play an active role in Hua Hui’s future marketing plans. In any pre-completion sale, the amount of the down payment that we will be able to obtain from a buyer is subject to the housing policy of governing real estate authorities. The current policy allows for a down payment ranging from 30% to 50% of the sales price dependent on the property size. As mentioned, Hui Hua will act as the sales agent and is expected to receive a sales commission of not less than 0.5% and not more than 8% of the unit sales price. Hua Hui has informed us that in course of selling the units, it will act in good faith in selling the units and will not act preferentially toward selling its units over the units of the Company. However, at the present time, the Company does not have a formal agreement with Hua Hui regarding sales commission or the manner of sale with respect to the units. As of the date of this filing, we have not sold any of the units. Our working capital budget for the next 12 months is approximately $485,000 which relate principally to costs of our executive offices. This amount is comprised of $180,000 in professional fees, $130,000 in salaries and related personnel costs, $75,000 for executive office rent, and $100,000 in miscellaneous expenses. We will not incur any costs of marketing the Project. We expect to generate revenues from the sale of the apartment units in August 2012. Thereafter, subject to the foregoing, we believe that revenues from the Project will be sufficient to fund our ongoing working capital needs. Our business strategies are subject to certain risks and uncertainties, including our ability to raise additional funds in the future. We cannot predict whether we will be successful in any of business strategies. We do not anticipate seasonal fluctuations in our business. We will be subject to intense competition in the sale of our apartment units in the Project from other real estate developers and development projects in the local Changde real estate market. Despite the competition, we believe that our competitive advantages are as follows; it is in close proximity to several tourist destinations and commercial areas; it features many amenities with the Huadun Changde International Hotel Complex, including on site restaurants, café, bars, tea house, fitness club, beauty salon, swimming pool, and shopping mall; and we believe that it is a well designed and well constructed building. Management believe that the number of Chinese consumers able and willing to purchase second homes for vacationing will increase with China’s continued explosive growth. These wealthy consumers are spread throughout the country. This nationwide concentration of potential buyers requires a targeted national media marketing, which is something we will be able to offer as part of our overall marketing and sales strategy. We do not own any patents, trademarks or licenses. We view our company’s name and the reputation associated with our name as an important asset, but we have not registered our company’s name as a trademark. As of September 30, 2011, we had five full-time employees and two part-time officers in China. We are subject to a variety of possible risks that could adversely impact our revenues, results of operations or financial condition. Some of these risks relate to the industry in which we operate, while others are particular to us. The following factors set out potential risks we have identified that could adversely affect us. Our independent public accounting firm has issued an opinion on our consolidated financial statements that states that the consolidated financial statements were prepared assuming we will continue as a going concern and further states that our recurring losses from operations, stockholders’ deficit and inability to generate sufficient cash flow to meet our obligations and sustain our operations raise substantial doubt about our ability to continue as a going concern. Our plans concerning these matters are discussed in “Liquidity and Capital Resources” of the Management’s Discussion and Analysis of Financial Condition and Results of Operations in Item 7 of this Form 10-K and Note 7 to the accompanying audited consolidated financial statements. Our future is dependent on our ability to execute our plans successfully or otherwise address these matters. If we fail to do so for any reason, we would not be able to continue as a going concern and could potentially be forced to seek relief through a filing under the U.S. Bankruptcy Code. We have an immediate need for capital and likely dilution. As reflected on our audited consolidated balance sheet for the fiscal year ended September 30, 2011 contained herein, we have total current assets of $16,079 and total current liabilities of $836,906. In addition, we will need additional capital of up to $0.5 million to maintain our current operations. This amount excludes funds needed to engage in any additional business activities which amount is undetermined at this time. The timing and amount of our capital requirements will depend on a number of factors, including the terms and conditions of agreements that we have to enter into with Hua Hui or other real estate developers, our initial operational results, with respect to the marketing and sale of the Project units, the need for other expenditures, and competitive pressures. If additional funds are raised through the issuance of equity or convertible debt securities, the percentage ownership of our then-existing stockholders will likely be reduced significantly. We cannot make assurances that any financing will be available on terms favorable to us or at all. If adequate funds are not available on acceptable terms, our ability to fund our business strategy, ongoing operations, take advantage of unanticipated opportunities, or otherwise respond to competitive pressures could be significantly limited. Our business, financial condition and results of operations will be harmed by such limitations. We cannot predict whether our new business endeavors will be successful. We planned on entering into a real estate business which is a new business endeavor for us. We changed our name to China Grand Resorts Inc. in order to reflect our new business direction. Presently, we have suspended our plans to develop this business, and are evaluating other markets and business opportunities. Apart from revenues received from the sale of the Project units, we may have difficulty in developing or managing any other new businesses. There is a possibility that we have insufficient expertise to engage in these new activities profitably or without incurring significant amounts of development expenses or risk. We will face competition in the sale of our apartments. We will face competition in the sale of our apartments located in the city of Changde, Hunan Province. The city of Changde is a developing business center and resort destination, and is populated by numerous development projects, including apartment projects. While we believe that the demand for apartments in the area will exist for the coming years, it is conceivable that we may not be able to sell all of our units or the sale of such units may not occur at a sales rate or at prices that we have projected. The occurrence of any such event will adversely affect our business. The PRC government may adopt further measures to curtail the overheating of the property sector. Along with the economic growth in China, investments in the property sector have increased significantly in the past few years. In response to concerns over the scale of the increase in property investments, the PRC government has introduced policies to limit rapid growth in property sale price. The PRC government’s restrictive regulations and measures to curtail the overheating of the property sector could limit our access to capital resources or even restrict our business operations. We cannot be certain that the PRC government will not issue additional and more stringent regulations or measures, which could further slow down property development in China and adversely affect the sale of our apartments. Changes in overall economic conditions could have a material impact on our business. Our results of operations could be impacted by changes in overall economic conditions that impact consumer spending within the PRC. Future economic conditions affecting disposable income such as employment levels, consumer confidence, business conditions, stock market volatility, weather conditions, acts of terrorism, threats of war, and interest and tax rates could reduce consumer spending or cause consumers to shift their spending away from real estate driven products, which may have a material adverse impact on our business, operating results and financial condition. We rely on key management personnel. Our success will depend, in part, on the efforts of our executive officers and other key employees. The market for qualified personnel is competitive and our future success will depend upon, among other factors, our ability to attract and retain these key personnel. The loss of the services of any of our key management personnel or the failure to attract and retain employees could have a material adverse effect on our results of operations and financial condition due to the resulting disruptions in the leadership and continuity of our business relationships. Our officers and directors may allocate their time and efforts to other businesses thereby causing conflicts of interest in their determination as to whether or not to present business opportunities to the Company and as to how much time to devote to our affairs. Our officers and directors, including Mr. Menghua Liu, are not required to commit their full time to our affairs, which may result in a conflict of interest in allocating their time between our operations and other businesses. All of our executive officers are engaged in several other business endeavors and are not obligated to contribute any specific number of hours to our affairs. If our executive officers’ other business affairs require them to devote more substantial amounts of time to such affairs, it could have a negative impact on our current business and future business development. We intend to protect our interests in having these officers and directors remain part of our company and prioritize their time and resources in such a way that will benefit our interests, although no assurances thereof can be given. Our officers and directors may become aware of business opportunities which may be appropriate for presentation to us as well as the other entities to which they owe fiduciary duties. Accordingly, they may have conflicts of interest in determining to which entity a particular business opportunity should be presented. Beijing Hua Hui Hengye Investment Ltd. owns a large percentage of our outstanding common shares and may have the ability to influence matters requiring shareholder approval. • approval of our business plans and general business development. There can be no assurance that our controlling shareholders will exercise their control in our best interests. China’s legal system is characterized by uncertainty that could negatively impact our business and results of operations. While we are incorporated in the State of Nevada, United States, substantially all of our operations are in China. As such, we are subject to and rely on Chinese law in our daily operations. The Chinese legal system is a civil law system based on written statutes. Unlike common law systems, it is a system in which decided legal cases have little value as precedent. Beginning in 1979, the PRC government promulgated a comprehensive system of laws and regulations governing economic matters, which has had the overall effect of significantly enhancing the protections afforded to foreign invested enterprises in China. However, these laws, regulations and legal requirements are relatively new and are evolving rapidly, and their interpretation and enforcement involve uncertainties. These uncertainties could limit the legal protections available to foreign investors. In addition, enforcement of existing laws, or contracts based on existing law, may be uncertain and sporadic. Furthermore, interpretation of statutes and regulations may be subject to new government policies reflecting domestic political changes. Our activities in China are subject to administrative review and approval by the State Administration of Industry and Commerce of the PRC government. Because of the changes occurring in China’s legal and regulatory structure, we may not be able to secure or renew the requisite governmental approvals for our activities. Failure to obtain or maintain the requisite governmental approvals for any of our activities could adversely affect our business and results of operations. Any recurrence of severe acute respiratory syndrome, or SARS, or another widespread public health problem, could negatively impact our business and results of operations. • a general slowdown in the Chinese economy. Any of the foregoing events or other unforeseen consequences of public health problems could adversely affect our business and results of operations. Changes in China’s political and economic policies could negatively impact our business. • balance of payments position. As a result of these differences, our business may not develop in the same way or at the same rate as might be expected if the Chinese economy were similar to those of the OECD member countries. Rapidly developing Chinese tax laws could negatively affect our businesses. On March 16 2007, the Chinese government produced a new set of revised tax laws. In these tax laws, effective from January 1, 2008, income tax for companies of our type was reduced from 33% to 25%, resulting in a corresponding increase in net income for our company. However, given China’s rapidly changing tax laws and the difference between national tax policy and local tax policy, we could and likely will be exposed to other fluctuations in income associated with these taxes, including but not limited to business taxes, VAT, income taxes, and other taxes. Restrictions on foreign currency exchange may limit our ability to receive and use our revenues effectively. Any future restrictions on currency exchange may limit our ability to use revenues generated in Renminbi to make payments in U.S. dollars or other foreign currencies. Although the Chinese government introduced regulations in 1996 to allow greater convertibility of the Renminbi for current account transactions, significant restrictions still remain, including primarily the restriction that foreign invested enterprises may only buy, sell and/or remit foreign currencies at those banks authorized to conduct foreign exchange business after providing valid commercial documents. In addition, remittance of foreign currencies abroad and conversion of Renminbi for capital account items, including direct investment and loans, is subject to governmental approval in China, and companies are required to open and maintain separate foreign exchange accounts for capital account items. We cannot be certain that the Chinese regulatory authorities will not impose more stringent restrictions on the convertibility of the Renminbi, especially with respect to foreign exchange transactions. Fluctuations in the value of the Renminbi could negatively impact our results of operations. Our revenues, operating expenses and substantially all of our assets and liabilities are denominated in Renminbi. Our reporting currency is the U.S dollar. As a result, we are exposed to foreign exchange risk, and our results of operations may be negatively impacted by fluctuations in the exchange rate between the U.S. dollar and Renminbi. A significant depreciation in the Renminbi against the U.S. dollar will cause a decrease in our net profits, if any, or increases in net losses we may suffer. The RMB is currently freely convertible under the “current account”, which includes dividends, trade and service-related foreign exchange transactions, but not under the “capital account”, which includes foreign direct investment. In addition, commencing on July 21, 2005, China reformed its exchange rate regime by changing to a managed floating exchange rate regime based on market supply and demand with reference to a basket of currencies. Under the managed floating exchange rate regime, the RMB is no longer pegged to the U.S. dollar. The exchange rate of the RMB against the U.S. dollar was adjusted to RMB8.11 per U.S. dollar as of July 21, 2005, representing an appreciation of about 2%. The People’s Bank of China will announce the closing prices of foreign currencies such as the U.S. dollar traded against the RMB in the inter-bank foreign exchange market after the closing of the market on each business day, and will make such prices the central parity for trading against the RMB on the following business day. On May 19, 2007, the People’s Bank of China announced a policy to expand the maximum daily floating range of RMB trading prices against the U.S. dollar in the inter-bank spot foreign exchange market from 0.3% to 0.5%. While the international reactions to the RMB revaluation and widening of the RMB’s daily trading band have generally been positive, with the increased floating range of the RMB’s value against foreign currencies, the RMB may appreciate or depreciate significantly in value against the U.S. dollar or other foreign currencies in the long term, depending on the fluctuation of the basket of currencies against which it is currently valued. On June 19, 2010, the People’s Bank of China announced that it has decided to proceed further with the reform of the RMB exchange rate regime to enhance the flexibility of the RMB exchange rate and that emphasis would be placed on reflecting market supply and demand with reference to a basket of currencies. While so indicating its intention to make the RMB’s exchange rate more flexible, the People’s Bank of China ruled out any sharp fluctuations in the currency or a one-off adjustment. In early November 2011, the center point of the currency’s official trading band hit 6.3165, representing appreciation of more than 7.6% since June 19, 2010. As a result of the announcement, the RMB may appreciate or depreciate more significantly in value against the U.S. dollar or other foreign currencies in the long term, depending on the market supply and demand with reference to a basket of currencies. As of September 30, 2011, the exchange rate was 6.3549 RMB to 1.00 U.S. Dollar. The exchange rate of Renminbi is subject to changes in China’s government policies which are, to a large extent, dependent on the economic and political development both internationally and locally and the demand and supply of Renminbi in the domestic market. There can be no assurance that such exchange rate will continue to remain stable in the future amongst the volatility of currencies, globalization and the unstable economies in recent years. The Chinese government imposes controls on the conversion of RMB to foreign currencies and, in certain cases, the remittance of currencies out of China. As our domestic sales operations expand, we expect to derive an increasing percentage of our revenues in RMB. Under our current structure, we expect our income will be primarily derived from dividend payments from our Chinese subsidiaries. Shortages in the availability of foreign currency may restrict the ability of our Chinese subsidiaries and our affiliated entities to remit sufficient foreign currency to pay dividends or other payments to us, or otherwise satisfy their foreign currency denominated obligations. Under existing Chinese foreign exchange regulations, payments of current account items, including profit distributions, interest and principal payments on outstanding notes (including our recently completed convertible note financing) and expenditures from trade-related transactions, can be made in foreign currencies without prior approval from the People's Republic of China State Administration of Foreign Exchange by complying with certain procedural requirements. However, approval from appropriate government authorities is required when RMB is to be converted into foreign currency and remitted out of China to pay capital expenses such as the repayment of bank loans denominated in foreign currencies. The Chinese government at its discretion also may restrict access in the future to foreign currencies for current account transactions. If the foreign exchange control system prevents us from obtaining sufficient foreign currency to satisfy our demands, we may not be able to pay dividends in foreign currencies to our shareholders, including holders of our common stock. There has been only a limited public market for our common stock to date. To date, there has been only a limited public market for our common stock on the Over-the-Counter Bulletin Board. Our common stock is currently not listed on any exchange. If an active trading market for our common stock does not develop, the market price and liquidity of our common stock will be materially and adversely affected. The market price for our common stock may be volatile. · general economic or political conditions in China. In addition, the securities market has from time to time experienced significant price and volume fluctuations that are not related to the operating performance of particular companies. These market fluctuations may also materially and adversely affect the market price of our Common stock. We will need additional capital, and the sale of additional common stock or other equity securities could result in additional dilution to our stockholders. As mentioned herein, we expect to have an immediate need for capital to fund day to day operations as well as our planned business operations. To satisfy our cash requirements, we may receive loans from affiliates, and/or seek to sell additional equity or debt securities (in addition to our recently completed financing or obtain a credit facility. The sale of additional equity securities could result in additional dilution to our stockholders. The incurrence of indebtedness would result in increased debt service obligations and could result in operating and financing covenants that would restrict our operations. The conversion of any debt, including outstanding loans in favor of affiliates, will also result in significant dilution to existing shareholders. We cannot assure you that financing will be available in amounts or on terms acceptable to us, if at all. Substantial future sales or the perception of sales of our common stock in the public market could cause the price of our common stock to decline. Sales of our common stock in the public market or the perception that these sales could occur, could cause the market price of our common stock to decline. As of September 30, 2011, approximately 70,281 shares, or 2.15% of our outstanding shares can be freely transferable without restriction or additional registration under the Securities Act of 1933, as amended, or are subject to a pending registration statement. The remaining common stock outstanding as of such date will be available for sale, subject to volume and other restrictions as applicable under Rule 144 under the Securities Act. As a public company, we will incur significant legal, accounting and other expenses that we did not incur as a private company. In addition, the Sarbanes-Oxley Act, as well as rules subsequently implemented by SEC has required changes in corporate governance practices of public companies. We expect these new rules and regulations to increase our legal, accounting and financial compliance costs and make certain corporate activities more time-consuming and costly. In addition, we will incur additional costs associated with our public company reporting requirements. We are currently evaluating and monitoring developments with respect to these new rules, and we cannot predict or estimate the amount of additional costs we may incur or the timing of such costs. There is a limited public float of our common stock, which can result in increased volatility in our stock price and prevent the realization of a profit on resale of the Company’s common stock. There is a limited public float of our common stock. The term “public float” refers to shares freely and actively tradable on the Over-the-Counter Bulletin Board System and not owned by officers, directors or affiliates, as defined under the Securities Act. Due to our relatively small public float and the limited trading volume of our common stock, purchases and sales of relatively small amounts of our common stock can have a disproportionate effect on the market price for our common stock. As a result, the market price of our common stock can have increased volatility which may affect a stockholder’s ability to sell our shares in a timely manner. Our common stock is subject to restrictions on sales by broker-dealers and penny stock rules, which may be detrimental to investors. Our common stock is subject to Rules 15g-1 through 15g-9 under the Securities Exchange Act of 1934, which imposes certain sales practice requirements on broker-dealers who sell our common stock to persons other than established customers and “accredited investors” (as defined in Rule 501(c) of the Securities Exchange Act). For transactions covered by this rule, a broker-dealer must make a special suitability determination for the purchaser and have received the purchaser’s written consent to the transaction prior to the sale. This rule adversely affects the ability of broker-dealers to sell our common stock and purchasers of our common stock to sell their shares of our common stock. Additionally, our common stock is subject to SEC regulations applicable to “penny stock.” Penny stock includes any non-Nasdaq equity security that has a market price of less than $5.00 per share, subject to certain exceptions. The regulations require that prior to any non-exempt buy/sell transaction in a penny stock, a disclosure schedule proscribed by the SEC relating to the penny stock market must be delivered by a broker-dealer to the purchaser of such penny stock. This disclosure must include the amount of commissions payable to both the broker-dealer and the registered representative and current price quotations for our common stock. The regulations also require that monthly statements be sent to holders of penny stock that disclose recent price information for the penny stock and information of the limited market for penny stocks. These requirements adversely affect the market liquidity of our common stock. Your ability to bring an action against us or against our directors and officers, or to enforce a judgment against us or them, may be limited because we conduct substantially all of our operations in China and all of our directors and officers reside outside of the United States. We conduct substantially all of our operations in China. All of our directors and officers reside, and substantially all of the assets of those persons are located, outside the United States. As a result, it may be difficult for you to bring an action against us or against these individuals in the United States in the event that you believe that your rights have been infringed under the securities laws or otherwise. Even if you are successful in bringing an action of this kind, the laws of China may render you unable to enforce a judgment against our assets or the assets of our directors and officers. In December 2009, we relocated our office to a new location in Beijing consisting of 192.70 square meters. The new Beijing office lease is from December 11, 2009 to December 10, 2011 and provides for monthly lease payment of $5,333 with two months period of free rent. In August 2011, we renewed this lease agreement from December 11, 2011 to December 12, 2012. Our new monthly lease payment is $6,253. Moreover, we have entered into a second building lease for the office located in Beijing consisting of 10 square meters. This Beijing facilities lease is from July 3, 2010 to July 2, 2011 and provides for monthly lease payment of $26. We believe our current facilities are adequate for the purposes for which they are currently used and are well maintained. See Note 8 to our audited consolidated financial statements included in this Annual Report for a further discussion of our lease commitments. We are not involved in any current, and are not aware of any pending, legal proceedings involving our company or our officers and directors which may have any material impact on our results of operations or financial position. Effective on November 16, 2009, we executed a 20 for 1 basis reverse stock split. As of September 30, 2011, our common stock was quoted on the Over the Counter Bulletin Board under the symbol “CGND” and we had approximately 123 shareholders holding 3,272,311 shares of common stock. The above prices have been adjusted for the 20 for 1 reverse stock split which occurred on November 16, 2009. We have not paid, nor declared, any dividends since our inception and do not intend to declare any such dividends in the foreseeable future. Our ability to pay dividends is subject to limitations imposed by Nevada law. Under Nevada law, dividends may be paid to the extent that a corporation’s assets exceed its liabilities and it is able to pay its debts as they become due in the usual course of business. In 2001, we adopted a stock plan (the “2001 Stock Plan”). Under the terms and conditions of the 2001 Stock Plan, our board of directors is empowered to grant stock options to our employees, consultants, officers and directors of the Company. Additionally, our board of directors has the power to determine, at the time of granting any such options, the vesting provisions and whether the options will be qualified as Incentive Stock Options under Section 422 of the Internal Revenue Code (Section 422 provides certain tax advantages to the employee recipients). The 2001 Stock Plan was approved by our shareholders on September 15, 2001. The total number of shares of common stock available under the 2001 Stock Plan may not exceed 100. As of September 30, 2011, no options had been granted under the 2001 Stock Plan. Except for the historical information, the following discussion contains forward-looking statements that are subject to risks and uncertainties, and which speak only as of the date of this annual report. No one should place strong or undue reliance on any forward looking statements. Our actual results or actions may differ materially from these forward-looking statements for many reasons, including the risks described in Item 1A and elsewhere in this annual report. This Item should be read in conjunction with the financial statements and related notes and with the understanding that our actual future results may be materially different from what is currently expected or projected by us. We were organized under the laws of the State of Nevada on September 21, 1989. We went engaged in a variety of business, described in part below, and effected various name changes prior to November 2009 when the name was changed to China Grand Resorts, Inc. Our subsidiary is Sun New Media Transaction Service Ltd. (“SNMTS”), a company incorporated in Hong Kong, which has a wholly owned subsidiary China Focus Channel Development Co., Ltd (“CFCD”), a company incorporated in People’s Republic of China. During the three year period prior to December 2007, our principal business was providing marketing, brand management, advertising, media planning, public relations and direct marketing services to clients in the PRC. During December 2007 and January 2008, we re-directed our business towards providing mobile phone based services. In January 2008, we divested ourselves of our advertising and marketing business. On December 31, 2007, we acquired a 70% equity interest in Jiangxi Hongcheng Tengyi Telecommunication Company, Ltd (“JXHC”), a local reseller of top-up mobile minutes in Jiangxi Province. Effective March 31, 2009, we acquired a Provincial Class One Full Service Operator license for the Jiangxi Province, PRC. The Class One license enabled us to sell mobile phone based products within the Jiangxi province. During this period, we also acquired other mobile phone based technologies to compliment our existing technology. We sought to market these technologies in the Jiangxi Province of China through JXHC utilizing our recently acquired Class One license. However, due to a lack of operating funds and other factors beyond our control, JXHC was unable to effectively develop its business. Consequently, effective on March 31, 2009, we sold our ownership in JXHC to an unaffiliated third party for $100. On March 30, 2009, we acquired additional mobile internet software technology through our acquisition of GlobStream Technology Inc. (“Globstream”) from its shareholders for $156,000. GlobStream was founded by Dr. Wenjun Luo, our former director. In May of that same year, we terminated the operations related to GlobStream. Effective on August 1, 2009, we sold our ownership in GlobStream to Hua Hui. On August 1, 2009, as mentioned throughout this Form 10-K, we entered into a subscription agreement with Beijing Hua Hui Investment Ltd., an unaffiliated company organized under the laws of the PRC (“Hua Hui”). Hua Hui is part of The Beijing Hua Hui Corporation, a PRC real estate construction and development conglomerate that specializes in constructing and developing travel, resort, hotel, and apartment properties in popular tourist and other destinations within the PRC. Under the Agreement, we received from Hua Hui the commercial income rights (described herein) to 10,000 square meters of apartment space in the concerning Building of the Huadun Changde International Hotel’s Apartment Complex located in the city of Changde in China’s Hunan Province (“Project”). The Project is currently under development by Hua Hui. The parties have valued the commercial income rights at $8,777,000. As consideration, we agreed to pay a total of $7,317,000, to be satisfied by issuing Hua Hui subject to certain conditions, a total of 2,774,392 shares of our common stock which is valued at $2.40 per share (the closing price of our common stock on the transaction date, August 1, 2009, after giving effect of 20 for 1 reverse split) for a total stock value of $6,658,536. As additional consideration, Hua Hui received from us all of the shares of the GlobStream Technology Inc., our wholly owned subsidiary, certain assets of Sun New Media Transaction Services Limited and China Focus Channel Development Co., Ltd, and certain other miscellaneous assets of us which were valued at $658,241. During fiscal years ended September 30, 2010 and 2011, we had no revenue from operations. We expect to receive revenues upon completion of the Project related to sales of the apartment units. The completion of the Project is expected to occur on or about August 31, 2012. Unless otherwise indicated, all amounts are in U.S. Dollars. For the year ended September 30, 2011, we were developing our new business strategy discussed above. As a result, we had no revenues from operations or gross margin. During the comparable period in 2010, we had no revenues and related expenses from our former consulting business due to the general slowdown in economic activity in the PRC during such period. During the year ended September 30, 2011, we incurred general and administrative expenses of $221,182 compared with $287,751 for the year ended September 30, 2010. The reduction in general and administrative expenses is primarily due to reduced overhead at the corporate level, principally due to reduced consulting and professional fees. Commencing in 2009 and continuing to the present, we made an effort to reduce our ongoing overhead expenditures, which includes personnel reductions and office expense, due to our reduced operations. We also had $8,728 in depreciation and amortization for the year ended September 30, 2011 compared with $6,604 for the comparable year ended September 30, 2010, the difference is due to the increase of fixed assets during the current period. Our loss from operations for the year ended September 30, 2011 was $229,910 compared to $294,355 for the year ended September 30, 2010. The difference between the periods is due to the reduction of general and administrative expenses discussed above. Other expense for the year ended September 30, 2011 and the corresponding 2010 period was $28,278 and $13,647, which is mainly comprised of interest expense. Interest expense relates to the loans from Hua Hui. The increase in interest expense for the current annual period is a result of higher principal loan amounts from Hua Hui for such period. Our loss from continuing operations was $258,188 for the year ended September 30, 2011 compared to a loss of $308,002 for the year ended September 30, 2010. The difference is due to the reasons discussed above. As a result of the foregoing, our net loss was $258,188 for the year end September 30, 2011 compared with a loss of $308,002 for the year ended September 30, 2010. For the year ended September 30, 2011, we had a foreign currency translation loss of $28,652 compared with a gain of $4,218 for the year ended September 30, 2010. The difference is due to the fluctuations of value of the US dollar in comparison to the RMB. As a result, we had a total comprehensive loss of $286,840 for the year ended September 30, 2011 compared with a total comprehensive loss of $312,220 for year ended September 30, 2010. Recently, we have financed our operations primarily through cash generated from a mixture of short and long-term loans including loans from affiliates, and issuance of common stock. The net cash used in operating activities for year ended September 30, 2011 was $249,048, compared with net cash used in operating activities of $377,963 for year ended September 30, 2010. The $128,915 difference is due to the reduction of general and administrative expenses discussed above during the year ended September 30, 2011. The net cash used in the investing activities for the year ended September 30, 2011 was $Nil, compared with net cash provided by investing activities of $47,554 for the year ended September 30, 2010. The difference of $47,554 is due to no investing activities during the year ended September 30, 2011. The net cash provided by financing activities for the year ended September 30, 2011 was $178,228, compared with net cash provided by financing activities of $482,212 for year ended September 30, 2010. There was a difference of $303,984 which is primarily due to the reduction of the shareholder loans during the year ended September 30, 2011. The effect of the exchange rate on cash was a loss of $1,186 for the year ended September 30, 2011, compared with loss of $4,746 for the year ended September 30, 2010. The difference is due to reduction in foreign currency transactions. The difference in the closing balance of cash and cash equivalent (closing balance) for the year ended September 30, 2011 and 2010 is due to the reasons mentioned above. We continue to experience significant losses from operations. As discussed below, we anticipate that we will generate sales from the Project commencing in August 2012. However, nonetheless we have an immediate need for capital to funds our ongoing working capital needs, along with any new business endeavors that we may undertake. We anticipate raising capital through additional private placements of our equity securities, and, if available on satisfactory terms, debt financing. It is conceivable that funding of all or part of the budget required above may come from either or both Hua Hui, our largest shareholder, or Redrock Capital Venture Limited, a shareholder. Commencing in June 2009, we began receiving loans from Redrock Capital Venture Limited. As of September 30, 2011, the amount due to Redrock is $100,280, in which the amount is due on demand and bears no interest. In addition, commencing in October 2009, we received loans from Hua Hui, our majority shareholder, in various increments totaling approximately $660,000 as the date of this report. These loans are due on demand and bear interest at the prevailing rate charged by the PRC Central Bank on the payment date. However, we do not have any agreements, arrangements or commitments with or guarantees from any party, including our largest shareholder or Redrock, to provide funding to us. We cannot guarantee that we will be successful in our efforts to enhance our liquidity. If we are unable to raise sufficient funds to meet our cash requirements as described above, we may be required to curtail, suspend, or discontinue our current and/or proposed operations. Our inability to raise additional funds as described above may force us to restructure, file for bankruptcy, sell assets or cease operations, any of which could adversely impact our business and business strategy, and the value of our capital stock. Due to the current price of our common stock, any common stock based financing, including transactions with affiliates which may include equity conversions of outstanding loans, will likely create significant dilution to the then existing shareholders. In addition, in order to conserve capital and to provide incentives for our employees and service providers, it is conceivable that we may issue stock for services in the future which also may create significant dilution to existing shareholders. $485,000 for our executive offices expenditures, which includes $130,000 in salaries and related costs of personnel, $180,000 in professional fees, $75,000 in executive office rent, and $100,000 in miscellaneous office expenditures. We expect to generate revenues from the sale of the apartment units in August 2012. Thereafter, the Company believes that revenues from the Project will be sufficient to support our ongoing capital working needs for the ensuing six to twelve month period. However, our projections are subject to certain risks and uncertainties, including our ability to raise additional funds in the near future. We cannot predict whether we will successful with any of business strategies. In December 2009, we relocated our office to a new space in Beijing. The term of the old lease was from September 1, 2009 to July 31, 2011; however, we terminated the old lease on December 11, 2009 as mutually agreed with the landlord and with no penalty to us. The new office lease is from December 11, 2009 to December 10, 2011 and provides for monthly lease payment of $5,333 with two months period of free rent. In August 2011, we renewed this lease agreement from December 11, 2011 to December 12, 2012. Our new monthly lease payment is $6,253. Moreover, we have entered into another building lease for the office located in Beijing. The Beijing facilities lease is from July 3, 2010 to July 2, 2011 and provides for monthly lease payment of $26. The lease expenses for the year ended September 30, 2011 amounted to $63,984 and the total lease commitment for the year ended September 30, 2011 and 2012 is $17,193 and $76,414 respectively. Our significant accounting policies are described in Note 2 to our consolidated financial statements included in this Annual Report. We prepare our financial statements in conformity with U.S. GAAP, which requires our management to make estimates and assumptions that affect the reported amounts of assets and liabilities, disclosure of contingent assets and liabilities on the date of the financial statements and the reported amounts of revenues and expenses during the financial reporting period. Since the use of estimates is an integral component of the financial reporting process, actual results could differ from those estimates. Some of our accounting policies require higher degrees of judgment than others in their application. We consider the policies discussed below to be critical to an understanding of our financial statements as their application places the most significant demands on our management’s judgment. In February 2010, the FASB issued Accounting Standards Update (ASU) 2010-09 to amend ASC 855, Subsequent Events, whose effective date is for interim or annual reporting periods ending after June 15, 2010. As a result, ASU No. 2010-09 excludes SEC reporting entities from the requirement to disclose the date on which subsequent events have been evaluated. In addition, it modifies the requirement to disclose the date on which subsequent events have been evaluated in reissued financial statements to apply only to such statements that have been restated to correct an error or to apply U.S. GAAP retrospectively. In June 2009, the FASB issued Accounting Standards Update No. 2009-01, “Generally Accepted Accounting Principles” (ASC Topic 105) which establishes the FASB Accounting Standards Codification (“the Codification” or “ASC”) as the official single source of authoritative U.S. GAAP. All existing accounting standards are superseded. All other accounting guidance not included in the Codification will be considered non-authoritative. The Codification also includes all relevant Securities and Exchange Commission (“SEC”) guidance organized using the same topical structure in separate sections within the Codification. Following the Codification, the Board will not issue new standards in the form of Statements, FASB Staff Positions or Emerging Issues Task Force Abstracts. Instead, it will issue Accounting Standards Updates (“ASU”) which will serve to update the Codification, provide background information about the guidance and provide the basis for conclusions on the changes to the Codification. The Codification is not intended to change GAAP, but it will change the way GAAP is organized and presented. The Codification is effective for the companies’ 2009 financial statements and the principal impact on our financial statements is limited to disclosures as all future references to authoritative accounting literature will be referenced in accordance with the Codification. ASU No. 2010-06—Fair Value Measurements and Disclosures (Topic 820): Improving Disclosures about Fair Value Measurements. This Update amends ASC 820 subtopic 10 that requires new disclosures about transfers in and out of Levels 1 and 2 and activity in Level 3 fair value measurements. This Update also amends ASC 820 subtopic 10 to clarify certain existing disclosures. The new disclosures and clarifications of existing disclosures are effective for interim and annual reporting periods beginning after December 15, 2009, except for the disclosures about purchases, sales, issuances, and settlements in the roll forward of activity in Level 3 fair value measurements, which are effective for fiscal years beginning after December 15, 2010. The Companies expects that the adoption of the above updates issued in the year 2010 will not have any significant impact on its financial position and results of operations. We have not entered into any financial guarantees or other commitments to guarantee the payment obligations of any third parties. In addition, we have not entered into any derivative contracts that are indexed to our own shares and classified as shareholder’s equity, or that are not reflected in our consolidated financial statements. Furthermore, we do not have any retained or contingent interest in assets transferred to an unconsolidated entity that serves as credit, liquidity or market risk support to such entity. Moreover, we do not have any variable interest in any unconsolidated entity that provides financing, liquidity, market risk or credit support to us or engages in leasing, hedging or research and development services with us. We rely on SEC Staff Accounting Bulletin: No. 104 “Revenue Recognition in Financial Statements” (“SAB 104”) (ASC No.605) to recognize our revenue. SAB 104 in establishing our accounting policy states that revenue generally is realized or realizable and earned when all of the following criteria are met: (1) persuasive evidence of an arrangement exists, (2) delivery has occurred or services have been rendered, (3) the seller's price to the buyer is fixed or determinable, and (4) collectability is reasonably assured. We account for income taxes under ASC No 740, “Income Taxes,” as described in Note 11 to our audited consolidated financial statements included in this Annual Report. We record a valuation allowance to reduce our deferred tax assets to the amount that we believe is more likely than not to be realized. In the event we were to determine that we would be able to realize our deferred tax assets in the future in excess of their recorded amount, an adjustment to our deferred tax assets would increase our income in the period such determination was made. Likewise, if we determine that we would not be able to realize all or part of our net deferred tax assets in the future, an adjustment to our deferred tax assets would be charged to our income in the period such determination is made. We record income tax expense on our taxable income using the balance sheet liability method at the effective rate applicable in China in our consolidated statements of operations and comprehensive loss. There is no income tax expenses in 2010 and 2011 due to net loss occurred. Substantially all our revenues and expenses are denominated in Renminbi and HKD, which are translated to U.S. dollars as our reporting currency for our financial statements. As such, our primary foreign exchange risk is to changes in the value of the Renminbi relative to the U.S. dollar. See “Item 1A. Risk Factors - Fluctuations in the value of the Renminbi could negatively impact our results of operations.” We do not engage in any hedging activities, and as such, we may in the future experience economic loss or gain as a result of any foreign currency exchange rate fluctuations. Reference is made to the Index to the audited consolidated financial statements on Page F-1 for our audited consolidated financial statements and notes thereto and supplementary schedules which follow PART V, Item 15 herein. Under the supervision and with the participation of our management, including our Chief Executive Officer and our Chief Financial Officer, we undertook an evaluation of the effectiveness of the design and operation of our disclosure controls and procedures (as defined in Securities Exchange Act of 1934, Rules 13a-15(e) and 15d-15(e)) as of the end of the period covered by this report. The evaluation of our disclosure controls and procedures included a review of our processes and implementation and the effect on the information generated for use in this Annual Report on Form 10-K. As a result of such evaluation, Chief Executive Officer and the Chief Financial Officer have concluded that, as of the evaluation date, our such disclosure, controls and procedures are effective, providing them with material to provide reasonable assurance that the information relating to our company as required to be disclosed in the reports we file the Company files or submits under the Securities Exchange Act on a timely basis. There were no changes in our internal controls over of 1934 is (i) recorded, processed, summarized and reported within the time periods specified in the Securities and Exchange Commission's rules and forms, and (ii) accumulated and communicated to management, including the Company’s principal executive and principal financial reporting, known to our Chief Executive Officer or Chief Financial Officer, persons performing such functions, as appropriate, to allow timely decisions regarding disclosure. The Company believes that a control system, no matter how well designed and operated, cannot provide absolute assurance that the objectives of the control system are met, and no evaluation of controls can provide absolute assurance that all control issues and instances of fraud, if any, within a company have been detected. Management's Annual Report on Internal Control Over Financial Reporting. Our management assessed the effectiveness of the Company’s internal control over financial reporting as of September 30, 2011. The framework used by management in making that assessment was the criteria set forth in the document entitled “ Internal Control – Integrated Framework” issued by the Committee of Sponsoring Organizations of the Treadway Commission. Based on that assessment, our management has determined that as of September 30, 2011, the Company’s internal control over financial reporting was effective for the purposes for which it is intended. There is no change in our internal control over financial reporting occurred during the period covered by this report, fourth quarter of the fiscal year ended September 30, 2011 that has materially affected, or is reasonably likely to materially affect, our internal control over financial reporting. The following table sets forth the name, age, position and term of office for each our executive officers and directors. From 2004 to the present, Mr. Liu has served as the Chairman and Chief Executive Officer of The Beijing Hua Hui Corporation, a PRC company involved in real estate development and investment and the parent entity of Beijing Hua Hui Investment Ltd (“Hua Hui”), our largest shareholder. From 2007 to the present, he has been the Chairman of Beijing Yang Hong Ji Tourism Investment Limited, a PRC company involved in tourism and real estate development. Currently, Mr. Liu is also Chairman of the Supervisory Board of Da Yang Group. Prior to Hua Hui, Mr. Liu was director of New World of Hangzhou in Zhejiang Province and Vice Manager of Xin Ao Group. Mr. Liu has a master degree in International Project Management Professional (“IPMP”) from the Civil Engineering and Water Resources Institute of Tsinghua University. He also holds an MBA degree from Tsinghua University. Mr. Liu has extensive experience in tourism industry. From 2004 to the present, he has been the general manager of Beijing Hua Yang Hong Ji Tourism Investment Limited, a PRC company located in Beijing and an affiliate of Hua Hui. From 2000 to 2004, Mr. Liu served as the manager of Beijing Hui Zu Exhibition Limited. From 2007 to 2009, Mr. Liu served as the general manager of Beijing Custom Tourism Investment Limited. From 2008 to the present, Ms. Deng has been the vice general manager of Hua Hui and is also the director of the corporate culture center of Hua Hui. From 2007 to 2008, Ms. Deng served as the manager of the Guest Room Department of the Headquarter of Beijing Urban Construction Group. From 2003 to 2007, Ms. Deng served as the manager of the Lobby Department of Bei Yuan Hotel of Beijing Urban Construction Group. We believe that Messrs. Liu, Liu and Deng each provide valuable knowledge and expertise related to the Project and the Company’s core business. Thus, we believe that each such person possesses the necessary qualifications to be a director of the Company. Term of Office, Arrangements and Related Matters. (2) any conviction in a criminal proceeding or being subject to a pending criminal proceeding (excluding traffic violations and other minor offenses); (3) being subject to any order, judgment, or decree, not subsequently reversed, suspended or vacated, of any court of competent jurisdiction, permanently or temporarily enjoining, barring, suspending, or otherwise limiting his involvement in any type of business, securities or banking activities; or (4) being found by a court of competent jurisdiction (in a civil action), the SEC, or the Commodities Futures Trading Commission to have violated a federal or state securities or commodities law, and the judgment has not been reversed, suspended, or vacated. Except as set forth in our discussion below in “Certain Relationships and Related Transactions,” none of our directors, director nominees or executive officers has been involved in any transactions with us or any of our directors, executive officers, affiliates or associates which are required to be disclosed pursuant to the rules and regulations of the SEC. Our directors and executive officers are not related by blood, marriage or adoption. Compliance with Section 16(a) of the Securities Exchange Act of 1934. Section 16(a) of the Securities and Exchange Act of 1934 requires our officers and directors and persons who beneficially own more than 10% of the Company’s common stock (collectively, “Reporting Persons”) to file reports of beneficial ownership and changes in beneficial ownership with the SEC. Reporting Persons are required by SEC regulations to furnish us with copies of all Section 16(a) forms they file. The Company believes that for the year ended September 30, 2011, all Section 16(a) filing requirements applicable to our reporting persons were met. The Company believes that its current officers and largest shareholder will seek to comply timely with all future reporting under Section 16(a) of the Exchange Act. There have been no material changes to the procedures by which security holders may recommend nominees to the small business issuer's board of directors. Due to our limited capital resources, we did not maintain an audit committee financial expert. The following summary compensation table sets forth all compensation awarded to, earned by, or paid to the named executive officers paid by us during the fiscal years ended September 30, 2011 and 2010 in all capacities for the accounts of our executives, including the Chief Executive Officer (CEO) and Chief Financial Officer (CFO). No other executive officer received total annual salary and bonus compensation in excess of $100,000. (1) Menghua Liu has served as our Chairman, Chief Executive Officer and director since August 7, 2009. He became our acting Chief Financial Officer on December 14, 2010. The Company and Mr. Liu initially reached an oral agreement pursuant to which Mr. Liu will receive an annual salary of $50,000 per annum for fiscal years 2010, pro rated, and 2011, however, for fiscal year 2010 and 2011, Mr. Liu has agreed to waive his salary for such period. (2) Carla Zhou has served as our Chief Financial Officer from April 1, 2009 to February 5, 2010. The officer agreed to waive her salary for such period. (3) Xiaojun He was our Chief Financial Officer from February 5, 2010 to September 25, 2010. Except as stated above, for the fiscal period ending September 30, 2011, we had no employment agreements, arrangements, or obligations with our officers, and we do not have any other form of compensation payable to our officers or directors, including any stock option plans, stock appreciation rights, retirement plans, or long term incentive plans. Our executive officers are not entitled to severance payments upon the termination of their employment agreements, if any, or following a change in control. During the fiscal year 2011 we did not have a standing compensation committee. Our Board of Directors was responsible for the functions that would otherwise be handled by the compensation committee. All directors participated in deliberations concerning executive officer compensation, including directors who were also executive officers. However, none of our executive officers received any compensation during the last fiscal year. None of our executive officers has served on the Board of Directors or compensation committee (or other committee serving an equivalent function) of any other entities, any of whose executive officers served on our Board or Compensation Committee. Certain potential conflicts of interest are inherent in the relationships between our officers and directors and us, including the fact that our officers are not full time employees. From time to time, one or more of our affiliates may form or hold an ownership interest in and/or manage other businesses both related and unrelated to the type of business that we own and operate. These persons expect to continue to form, hold an ownership interest in and/or manage other businesses which may compete with ours with respect to operations, including financing, marketing, management time, services and potential customers. These activities may give rise to conflicts between or among the interests of us and other businesses with which our affiliates are associated. Our affiliates are in no way prohibited from undertaking such activities, and neither we nor our shareholders have any right to require participation in such other activities. Furthermore, because we intend to do business with some of our officers, directors and affiliates, as well as with firms in which some of our officers, directors or affiliates have a material interest, potential conflicts may arise between the respective interests of us and these related persons or entities. We believe that such transactions will be made on terms at least as favorable to us as those available from unrelated third parties. With respect to transactions involving real or apparent conflicts of interest, we will adopt policies and procedures which require that: (i) the fact of the relationship or interest giving rise to the potential conflict be disclosed or known to the directors who authorize or approve the transaction prior to such authorization or approval, (ii) the transaction be approved by a majority of our directors, and (iii) the transaction be fair and reasonable to us at the time it is authorized or approved by our directors. The following table sets forth as of September 30, 2011, the number and percentage of the 3,272,311 outstanding shares of common stock which, according to the information supplied to us, were beneficially owned by (i) each director, (ii) each executive officer, (iii) all directors and executive officers as a group and (iv) each person who, to our knowledge, is the beneficial owner of more than 5% of our outstanding common stock. Except as otherwise indicated, the persons named in the table have sole voting and dispositive power with respect to all shares beneficially owned, subject to community property laws where applicable. (1) Except as otherwise indicated, we believe that the beneficial owners of the common stock listed above, based on information furnished by such owners, have sole investment and voting power with respect to such shares, subject to community property laws where applicable. Beneficial ownership is determined in accordance with the rules of the SEC and generally includes voting or investment power with respect to securities. Shares of common stock subject to options or warrants currently exercisable, or exercisable within 60 days, are deemed outstanding for purposes of computing the percentage ownership of the person holding such option or warrants. (2) The shareholder is currently the holder of 832,318 shares of common stock of the Company. An additional 1,942,074 shares of our common stock have been issued and held in escrow in the name of a third party. The escrowed shares were issued in connection with a transaction between the shareholder and the Company on August 1, 2009 (Please refer to the Company’s Form 8-K filed on August 5, 2009, as amended on August 23, 2009 for a more complete description of the transaction with Hua Hui). The escrowed shares may be voted by the shareholder if an agreement is reached with the Company regarding on the matter at issue. Thus, the shareholder is deemed the beneficial owner of such shares. Mr. Menghua Liu is the Chairman and sole shareholder of Beijing Hua Hui Hengye Investment Ltd. and has voting and investment power over such shares. (3) Mr. Menghua Liu is the Chairman and sole shareholder of Beijing Hua Hui Hengye Investment Ltd. and is also our Chairman and Chief Executive Officer. (4) Xiangyang Liu is our Director. (5) Yanhong Deng is our Director. (6) Represents 92,683 shares of common stock held by Redrock Capital Venture Limited, 85,222 shares held by Her Village Limited, 11,776 shares held by Yang Lan Studio Limited, and 136 shares held directly by Ms. Yang Lan. Ms. Yang is the majority shareholder of Redrock, Her Village Limited, and Yang Lan Studio Limited and has voting and investment power over such shares. Except as stated herein, since the beginning of our last fiscal year, there have been no transactions or proposed transactions, involving us and any of our officers, directors, promoters, or control persons, or any related persons thereof, the amount of which exceeds $120,000. When referencing our common stock, the following transactions have not been split adjusted. On May 16, 2008, we acquired from Her Village Limited certain mobile phone and internet based technology for the sum of $1.2 million satisfied through the issuance of 150,000 (split adjusted) shares of our common stock. On July 4, 2008, we sold to Her Village Limited 50,000 (split adjusted) shares of our common stock for a total purchase price of $1,000,000. Her Village is owed or controlled by Yang Lan, one of our current shareholders and formerly a controlling shareholder. On March 23, 2009, we entered into an acquisition agreement with Globstream Technology Inc. (“Globstream”) and its shareholders whereby we acquire 100% of Globstream, a mobile technology internet software developer. We issued to the Globstream shareholders 44,219 shares of our common stock, valued at $3 per share and 7,782 warrants, with an exercise price of $3 per share. The value of the transaction was $156,000. Wenjun Luo, our former director and chief technical officer, was a majority shareholder of Globstream. Commencing in April 2009, we began receiving loans from Redrock Capital Venture Limited (“Redrock”), a BVI company. As of July 9, 2009, we had received $223,529 in loans from Redrock. These loans were due on demand and bore no interest. On July 9, 2009, we entered into an agreement to satisfy and cancel the outstanding loans in exchange for the issuance of 92,683 shares of our common stock. The shares were valued at $2.4 per share. Ms. Yang Lan is the majority shareholder of Redrock. She also is the controlling shareholder of Her Village Limited, one of our largest shareholders. After giving effect to the transaction, Redrock became the beneficial owner of 18.6% of our common stock and Ms. Yang Lan was deemed the beneficial owner of 38.1% of our common stock, on such date. Ms. Yang Lan is deemed the beneficial owner of 5.8% of our common stock as of January 13, 2011. On August 1, 2009, we entered into a subscription and asset sale agreement (the “Agreement”) with Beijing Hua Hui Hengye Investment Lt. (“Hua Hui”), an unaffiliated PRC company. The terms and provisions of the Agreement are described elsewhere in this Report. As result of the transaction, Hua Hui is deemed the beneficial owner of 84.8% of our outstanding shares. Commencing in June 2009, we began receiving additional loans from Redrock (other than as discussed above). As of September 30, 2010, the amount due to Redrock is $100,280, in which the amount is due on demand and bears no interest. Commencing in October 2009, we received loans from Hua Hui, our majority shareholder, in various increments totaling approximately $ 660,000 as the date of this report. These loans are due on demand and bear interest at the prevailing rate charged by the PRC Central Bank on the payment date. Our Board of Directors consists of Mr. Menghua Liu, Mr. Xiangyang Liu, and Ms Yanhong Deng, and none of the members have been determined by us to be independent directors within the meaning of the independent director guidelines of the New York Stock Exchange Rules. We do not have a nominating, compensation or audit committee or committees performing similar functions nor a written nominating, compensation or audit committee charter due to the limited size of our Board of Directors. As a result, the entire Board of Directors reviews executive compensation, audit, and nominating decisions. The aggregate fees billed for professional services rendered by Parker Randall CF (H.K.) CPA Limited, our current auditor, for the audit of our annual financial statements and services normally provided by the auditor in connection with statutory and regulatory filings or engagements was $20,000 for the fiscal year ended September 30, 2011. The aggregate fees billed for professional services rendered by UHY VOCATION HK CPA Limited, our former auditor, for the audit of our annual financial statements, review of our financial statements included in our quarterly reports and services normally provided by the auditor in connection with statutory and regulatory filings or engagements were $20,000 for the fiscal year ended September 30, 2010. There were no audit-related fees billed by our principal auditor during the fiscal year ended September 30, 2011 and 2010. The aggregate fees billed fiscal years ended September 30, 2011 and September 30, 2010 for professional services rendered by the principal auditor for tax compliance, tax advice, and tax planning were all $ Nil. There were no other aggregate fees billed in either of the last two fiscal years for products and services provided by the principal auditor, other than the services reported above. The audited consolidated financial statements filed in this Annual Report are listed on page F-4 to F-5 hereof. The Supplemental Schedule of Non-Cash Investing and Financing Activities appears on page F-7 hereof. (1) Incorporated by reference to our Annual Report on Form 10-KSB for the year ended December 31, 1999, filed on April 17, 2000. (2) Incorporated by reference to our report on Form 8-K filed on October 9, 2002. (3) Incorporated by reference to our Annual Report on Form 10-KSB for the year ended December 31, 2006, filed on June 28, 2006. (4) Incorporated by reference to our Registration Statement on Form S-8 filed on September 21, 2001. (5) Incorporated by reference to our Annual Report on Form 10-KSB for the year ended December 31, 2002, filed on May 20, 2003. (6) Incorporated by reference to our Annual Report on Form 10-KSB for the year ended March 31, 2004, filed on August 11, 2004. We have audited the accompanying consolidated balance sheets of China Grand Resorts, Inc. and Subsidiaries. (the “Company”) as of September 30, 2011, and the related consolidated statements of income and comprehensive income, stockholders’ equity and cash flows for the year ended September 30, 2011. These consolidated financial statements are the responsibility of the Company’s management. Our responsibility is to express an opinion on these consolidated financial statements based on our audits. In our opinion, the consolidated financial statements referred to above present fairly, in all material respects, the financial position of the Company as of September 30 2011, and the results of its operations and its cash flows for each of the year ended September 30, 2011 in conformity with accounting principles generally accepted in the United States of America. We have audited the accompanying consolidated balance sheet of China Grand Resorts, Inc. and Subsidiaries (collectively the “Company”) as of September 30, 2010, and the related consolidated statement of operations, changes in stockholders’ deficiency and comprehensive loss, and cash flows for the year ended September 30, 2010. These consolidated financial statements are the responsibility of the Company’s management. Our responsibility is to express an opinion on these consolidated financial statements based on our audits. We conducted our audit in accordance with the standards of the Public Company Accounting Oversight Board (United States). Those standards require that we plan and perform the audit to obtain reasonable assurance about whether the consolidated financial statements are free of material misstatement. The Company is not required to have, nor were we engaged to perform, an audit of its internal control over financial reporting. Our audit included consideration of internal control over financial reporting as a basis for designing audit procedures that are appropriate in the circumstances, but not for the purpose of expressing an opinion on the effectiveness of the Company’s internal control over financial reporting. Accordingly, we express no such opinion. An audit also includes examining, on a test basis, evidence supporting the amounts and disclosures in the consolidated financial statements, assessing the accounting principles used and significant estimates made by management, as well as evaluating the overall financial statement presentation. We believe that our audit provides a reasonable basis for our opinion. In our opinion, the financial statements referred to above present fairly, in all material respects, the financial position of the Company as of September 30, 2010 and the results of its operations and its cash flows for the year ended September 30, 2010 in conformity with accounting principles generally accepted in the United States of America. The accompanying financial statements have been prepared assuming that the Company will continue as a going concern. As discussed in Note 2(b), the Company has incurred significant losses from operations for the year ended September 30, 2010 and has a working capital deficiency as of September 30, 2010. These conditions raise substantial doubt about the Company’s ability to continue as a going concern. Management’s plans in regard to these matters are also described in Note 2(b). The financial statements do not include any adjustments that might result from the outcome of this uncertainty. 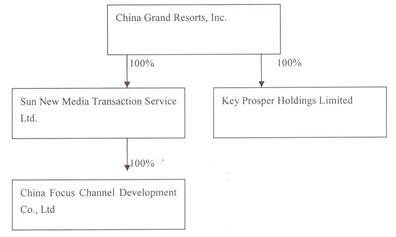 China Grand Resorts, Inc. (“CGND”) and its wholly owned subsidiaries Sun New Media Transaction Service Ltd. (“SNMTS”), China Focus Channel Development Co., Ltd (“CFCD”) and Key Proper Holdings Limited (“KPH”), financial statements defined herein below, collectively referred to as the “Company” or “we” have been prepared in accordance with accounting principles generally accepted in the United States of America (“US GAAP”). On November 16, 2009, the Company effected a 20 for 1 reverse split of our issued and outstanding common stock. The par value and our total number of authorized shares were unaffected by the reverse stock split. All shares and per share amounts in these consolidated financial statements and note thereto have been retrospectively adjusted to all periods presented to give effect to the reverse stock split. The Company was incorporated in the state of Nevada on September 21, 1989 under the name Fulton Ventures, Inc.
On March 30, 2009, we completed an acquisition pursuant to an Acquisition Agreement (the “Acquisition Agreement”) with the shareholders of GlobStream Technology Inc. (“GlobStream”) to acquire 100% of GlobStream, a Cayman Islands corporation for $156,000. GlobStream was founded by Dr. Wenjun Luo, one of our previous directors. In May 2009, we terminated the operations related to GlobStream because the mobile phone multi-media and advertising businesses of GlobStream were not performing well. Effective on August 1, 2009, the Company used the ownership in GlobStream to acquire from Beijing Hua Hui Hengye Investment Limited, the commercial income rights as detailed below – acquisition of commercial income rights. On July 1, 2007, the Company acquired 100% interest of SNMTS, a company incorporated in Hong Kong, and its wholly owned subsidiary CFCD, a company incorporated in the People’s Republic of China, from a third party for nominal consideration. In December 2009, the Company incorporated KPH, a company incorporated in the British Virgin Islands. On August 1, 2009, the Company entered into a subscription and asset sale agreement (the “Agreement”) with Beijing Hua Hui Hengye Investment Ltd. (“Hua Hui”), an unaffiliated PRC company. Hua Hui is an affiliate of The Beijing Hua Hui Corporation, a PRC real estate construction and development conglomerate that specializes in constructing and developing travel, resorts, hotels, and apartment properties in popular tourist and other destinations within the PRC. Under the Agreement, we received from Hua Hui the commercial income rights to 10,000 square meters of a 17 story apartment building in the Huadun Changde International Hotel’s Apartment Complex located in the city of Changde, Hunan Province (“Project”). The Project is currently under development by Hua Hui. The Apartment Complex consists of a total of 215,000 square meters located on an approximately 3.6 acre piece of land. The Project when completed, which is expected to occur in August_2012, will be comprised of a total 128 apartments, of which we will have the commercial rights to approximately 64 apartments. The commercial income rights means the exclusive right to own and/or receive any and all income and proceeds derived from these apartments pursuant to this Project in any capacity which were valued at approximately $8,777,000 by an independent valuation firm and we agreed to pay a total of $7,317,000 as consideration. In exchange, we agreed to issue to Hua Hui, 2,774,392 shares of our common stock valued at $2.4 per share (the closing price of the Company’s common stock on the transaction date, August 1, 2009 after giving effect of 20 for 1 reverse split) for a total stock value of $6,658,536 and transferred to Hua Hui certain other Company assets valued at $658,241. These assets consisted of all of our shares of the GlobStream, certain assets of both SNMTS and CFCD, and other miscellaneous assets of ours. On September 8, 2009, we satisfied the issuance of the 2,774,392 shares by issuing 832,318 shares to Wise Gold Investment Ltd., a British Virgin Island company acting on behalf of Hua Hui. On that same date, we also issued 1,942,074 shares of common stock to Blossom Grow Holdings Limited, a British Virgin Island company, as escrow agent under an escrow agreement by and among us the escrow agent, and Hua Hui. The escrow agent will hold the escrow shares pending completion of the Project which is expected to occur at or near the end of calendar 2010. If the escrow agent receives written instructions from the Company that the Project is completed in accordance with the terms of the Agreement, the escrow agent will release the escrow shares to Hua Hui. However, if after the projected completion date, the Project has not been completed, the escrow shares will continue to be held at escrow for one year. If after one year, the project still has not been completed, then the Company and Hua Hui will negotiate an agreement to deal with the escrow shares. On December 5, 2011, the Company entered into a Supplemental Agreement with Hua Hui and Blossom Grow Holdings Limited. The escrow agent will hold the escrow shares depending completion of the Project which is expected to occur on or near August 31 2012. If after August 31, 2012, the project still has not been completed, then the Company and Hua Hui will negotiate an agreement and reach to deal with the escrow shares. Due to certain architectural change implemented by Hua Hui to improve quality, style and appearance of the Project, Hua Hui has informed us that the Project is expected to be completed near August 31,2012. All permits concerning the Project have been acquired from governmental authorities, and the construction of the Project is approximately 85% completed as of November 30, 2011.During the escrow period, Hua Hui will be able to vote such shares provided it has reached an agreement with us on such matter(s), otherwise, the escrow agent will not vote on such matter(s). As a result, Hua Hui and Mr. Menghua Liu, Hua Hui’s Chairman and sole shareholder and the Company’s Chairman and Chief Executive Office, are deemed the beneficial owner of such shares. After giving effect to the transaction, Hua Hui became the Company’s majority shareholder and beneficially owns approximately 84.8% Company’s outstanding shares. With respect to the Project, we will not be responsible for project marketing and Hua Hui will perform the actual unit sales. We expect to pay Hua Hui a sales commission of not less than 0.5% and not more than 8% of the unit sales price and we will receive the remainder of the unit sales price. As of the date of this report, we do not have any formal agreements or arrangements with any developer or Hua Hui for fees that we will earn, or fees that we will pay Hua Hui. In January 2008, our business focus was based on the interest acquisition in Jiangxi Hongcheng Tengyi Telecommunication Company, Ltd (“JXHC”) and the Provincial Class One Full Service Operator license for the Jiangxi Province from Union Max Enterprises Ltd. We attempted to provide ancillary services for cell-phone customers in Jiangxi Province whereby customers could buy minutes on the fly using their debit card or bank account. However, in December 2008, due to third party issues which negatively affected our ability to launch that business, we determined to terminate that business which resulted in a sale of our interests to an unaffiliated third party effective in March 2009 for $100. The Company’s consolidated financial statements are prepared in accordance with accounting principles generally accepted in the United States of America (“US GAAP”) and applicable to a going concern, which contemplates the realization of assets and liquidation of liabilities in the normal course of business. The consolidated financial statements include the accounts of the Company and its subsidiaries, SNMTS, CFCD and KPH. All inter-company balances and transactions between the entities have been eliminated in consolidation. In June 2009, the Financial Accounting Standards Board (“FASB”) issued Accounting Standards Update No. 2009-01, “Generally Accepted Accounting Principles” (ASC Topic 105) which establishes the FASB Accounting Standards Codification (“the Codification” or “ASC”) as the official single source of authoritative “US GAAP”. All existing accounting standards are superseded. All other accounting guidance not included in the Codification will be considered non-authoritative. The Codification also includes all relevant Securities and Exchange Commission (“SEC”) guidance organized using the same topical structure in separate sections within the Codification. Following the Codification, the FASB will not issue new standards in the form of Statements, FASB Staff Positions or Emerging Issues Task Force Abstracts. Instead, it will issue Accounting Standards Updates (“ASU”) which will serve to update the Codification, provide background information about the guidance and provide the basis for conclusions on the changes to the Codification. The Codification is not intended to change GAAP, but it will change the way GAAP is organized and presented. The adoption of ASC 105 does not have an impact on the Company's consolidated financial statements. As of September 30, 2011, the Company had an accumulated deficit totaling $10,913,514 and negative working capital $820,827. The Company suffered a loss of $258,188 for the year ended September 30, 2011 and $308,002 for the year ended September 30, 2010. In view of the matters described above, the appropriateness of the going concern basis is dependent upon continuing operations of the Company, which in turn is dependent upon the Company's ability to raise additional capital, obtain financing and succeed in its future operations. The financial statements do not include any adjustments relating to the recoverability and classification of recorded asset amounts or amounts and classification of liabilities that might be necessary should the Company be unable to continue as a going concern. As a result of the transaction with Hua Hui as discussed in Note 1(a), we expect to receive the commercial income rights of the Project. The Company is actively pursuing additional capital in an effort to fund its ongoing capital requirements, as well as seeking agreements with potential strategic partners to develop its new business strategy. The preparation of the financial statements in conformity with US GAAP requires management of the Company to make a number of estimates and assumptions relating to the reported amounts of assets and liabilities and the disclosure of contingent assets and liabilities at the date of the financial statements and the reported amounts of revenues and expenses during the years presented. Actual results could differ from those estimates. The Company bases its estimates on historical experience and various other factors believed to be reasonable under the circumstances, the results of which form the basis for making judgments about the carrying value of assets and liabilities that are not readily apparent from other sources. Significant accounting estimates reflected in the Company's consolidated financial statements include allowance for doubtful accounts, estimated useful lives and contingent liabilities. The Company uses United States dollars (“U.S. Dollar” or “USD” or “$”) for financial reporting purposes. The subsidiaries within the Company maintain their books and records in their respective functional currency, Chinese Renminbi (“RMB”) and Hong Kong dollars (“HK$”), being the lawful currency in the PRC and Hong Kong, respectively. Assets and liabilities of the subsidiaries are translated from RMB or HK$ into U.S. Dollars using the applicable exchange rates prevailing at the balance sheet date. Items on the statements of operations and cash flows are translated at average exchange rates during the reporting period. Equity accounts are translated at historical rates. Adjustments resulting from the translation of the Company’s financial statements are recorded as accumulated other comprehensive income. There is no assurance that the RMB and HK$ amounts could have been, or could be, converted into U.S.
dollars at the above rates. Cash consists of cash on hand and at banks which are unrestricted as to withdrawal or use. Management believes that the banks which hold the Company’s cash are of high credit quality. Property and equipment are recorded at cost less accumulated depreciation and amortization. Expenditures for major additions and betterments that extend the useful lives of property and equipment are capitalized, upon being placed in service. Expenditures for maintenance and repairs are charged to general and administrative expense as incurred. Depreciation of property and equipment is computed by the straight-line method over the estimated useful lives of the assets. Leasehold improvements are amortized on a straight-line basis over the estimated useful life. Upon sale or retirement of property, plant and equipment, the related cost and accumulated depreciation are removed from the accounts and any gain or loss is reflect in operation. Long-lived assets, including intangible assets with definite lives and property, plant and equipment, are reviewed for impairment whenever events or changes in circumstances indicate that the carrying amount of an asset may not be recoverable. Recoverability of assets to be held and used is measured by a comparison of the carrying amount of an asset to the estimated undiscounted future cash flows expected to be generated by the asset. If the carrying amount of an asset exceeds its estimated future cash flows, an impairment charge is recognized by the amount by which the carrying amount of the asset exceeds the fair value of the asset. Based on the Company’s assessment, there have been no events or changes in circumstances that would indicate any impairment of long-lived assets as of September 30, 2011 and 2010. Level 2 - Observable inputs other than Level 1 prices such as quoted prices for similar assets or liabilities; quoted prices in markets that are not active; or other inputs that are observable or can be corroborated by observable market data for substantially the full term of the assets or liabilities. Determining which category an asset or liability falls within the hierarchy requires significant judgment. The Company evaluates its hierarchy disclosures each quarter. The carrying values of cash and cash equivalents, other receivables, other payables, shareholders payables and related party payable approximate fair values due to their short maturities. There was no asset or liability measured at fair value on a non-recurring basis as of September 30, 2011 and 2010. The Company follows the liability method of accounting for income taxes in accordance with ASC 740 “Income Taxes”. Under this method, future tax assets and liabilities are recognized for the future tax consequences attributable to differences between the financial statement carrying amounts of existing assets and liabilities and their respective tax balances. Future tax assets and liabilities are measured using enacted or substantially enacted tax rates expected to apply to the taxable income in the years in which those differences are expected to be recovered or settled. The effect on future tax assets and liabilities of a change in tax rates is recognized in income in the period that includes the date of enactment or substantive enactment. The tax loss arising from PRC can be carried forward for five years. Agreed tax losses by respective local tax authorities can be offset against future taxable profits of the respective companies. A valuation allowance is provided for deferred tax assets if it is more likely than not that the Company will not realize the future benefit, or if the future deductibility is uncertain. It is uncertain for the Company that the operating result in PRC will have profit and it is more likely than not that the Company will not realize the future benefit. Therefore, there was no deferred tax asset as of September 30, 2011 and 2010. The income tax rate is 25% for year 2011 and 2010 and there is no income tax expenses in 2011 and 2010 due to the net loss occurred. Revenue is recognized when the following four criteria are met as prescribed by U.S. Securities and Exchange Commission (“SEC”) Staff Accounting Bulletin No. 104 (“SAB 104”): (i) persuasive evidence of an arrangement exists, (ii) product delivery has occurred or the services have been rendered, (iii) the fees are fixed or determinable, and (iv) collectability is reasonably assured. Basic earnings (loss) per share is computed on the basis of the weighted-average number of shares of the Company’s common stock outstanding during the fiscal years. Diluted earnings (loss) per share is computed on the basis of the weighted-average number of shares of the common stock plus any (loss) effect of dilutive potential common shares outstanding during the year using the if-converted method. As the Company has a loss, presenting diluted net loss per share is considered anti-dilutive and not included in the consolidated statements of operations. The Company accounts for nonmonetary transactions based on the fair value of the assets (or services) involved in accordance with the requirements of FASB ASC Topic 845, “Nonmonetary Transactions”. Comprehensive income is defined as the change in equity of a company during the period from transactions and other events and circumstances excluding transactions resulting from investments from owners and distributions to owners. Accumulated other comprehensive income (loss), as presented on the accompanying consolidated statements of changes in equity and comprehensive income, consisted of cumulative foreign currency translation adjustment in each of the two years ended September 30, 2011 and 2010. The Company is subject to lawsuits, investigations and other claims related to operations, product, taxing authorities, environmental and other matters out of the normal course of business, and is required to assess the likelihood of any adverse judgments or outcomes to these matters, as well as potential ranges of probable losses and fees. A determination of the amount of reserves and disclosures required, if any, for these contingencies are made after considerable analysis of each individual issue. The Company accrues for contingent liabilities when an assessment of the risk of loss is probable and can be reasonably estimated. The Company discloses contingent liabilities when the risk of loss is reasonably possible or probable. Full time employees of the Company’s PRC subsidiary participate in a government mandated multi- employer defined contribution plan pursuant to which certain pension benefits, medical care, unemployment insurance, employee housing fund and other welfare benefits are provided to employees. The PRC labor regulations require the Company to accrue for these benefits based on certain percentages of the employees’ salaries. Cost for the pension and employee benefits for the year ended September 30, 2011 and 2010 were $41,983 and $31,952 respectively. Effective January 1, 2010, the Company adopted the provisions in ASU 2010-06, “Fair Value Measurements and Disclosures (ASC Topic 820): Improving Disclosures about Fair Value Measurements, which requires new disclosures related to transfers in and out of levels 1 and 2 and activity in level 3 fair value measurements, as well as amends existing disclosure requirements on level of disaggregation and inputs and valuation techniques. The adoption of the provisions in ASU 2010-06 did not have an impact on the Company’s consolidated financial statements. In February 2010, the Financial Accounting Standards Board (“FASB”) issued authoritative guidance that amends the disclosure requirements related to subsequent events. This guidance includes the definition of a Securities and Exchange Commission filer, removes the definition of a public entity, redefines the reissuance disclosure requirements and allows public companies to omit the disclosure of the date through which subsequent events have been evaluated. This guidance is effective for financial statements issued for interim and annual periods ending after February 2010. This guidance did not materially impact the Company’s results of operations or financial position, but did require changes to the Company’s disclosures in its financial statements. In April 2010, the FASB issued ASU No. 2010-13 – Compensation – Stock Compensation (Topic 718), which addresses the classification of an employee share-based payment award with an exercise price denominated in the currency of a market in which the underlying equity security trades. This Update provides amendments to Topic 718 to clarify that an employee share-based payment award with an exercise price denominated in the currency of a market in which a substantial portion of the entity’s equity securities trades should not be considered to contain a condition that is not a market, performance, or service condition. Therefore, an entity would not classify such an award as a liability if it otherwise qualifies as equity. The amendments in this Update are effective for fiscal years, and interim periods within those fiscal years, beginning on or after December 15, 2010. The Company expects that the adoption of the amendments in this Update will not have any significant impact on its financial position and results of operations. In April 2010, the EITF issued “Revenue Recognition – Milestone Method.” This issue provides guidance on defining a milestone and determining when it may be appropriate to apply the milestone method of revenue recognition for research or development transactions. This issue is effective on a prospective basis for milestones achieved in fiscal years beginning after June 15, 2010. Early adoption is permitted. The Company is currently evaluating the potential impact of this issue. Other accounting standards that have been issued or proposed by the FASB or other standards-setting bodies that do not require adoption until a future date are not expected to have a material impact on the Company’s consolidated financial statements upon adoption. As at September 30, 2011 and 2010, approximately 99% of the Company’s cash represented cash balances deposited with banks located in the PRC. According to existing PRC laws and regulations, remittance of these cash balances out of the PRC is subject to various restrictions imposed by the PRC government. The Company does not have any off-balance-sheet credit exposure as a result of its customers. Depreciation and amortization expenses for the year ended September 30, 2011 and 2010 were $8,728 and $6,604 respectively. (a)As of September 30, 2011 and 2010, the balances of other payables mainly included audit fees and other office expenses payables. (a) Commencing in June 2009, we began receiving funds from Redrock Capital Venture Limited, a shareholder, for working capital purpose. As of September 30, 2011, the amount due to Redrock is $100,280, which is due on demand and bears no interest. Redrock is a shareholder which owns approximately 2.8% of our outstanding common stock. (b) Commencing in October 2009, we began receiving funds amounting to approximately $660,000 from Hua Hui, an 84.8% shareholder, for the working capital purpose. The amount is due on demand and bears interest at the prevailing rate charged by the PRC Central Bank. The interest accrued for the year amounted to approximately $28,127 and the effective interest rate of the loans was 4.38%. On January 4, 2009, the Company received a notice of claims (the “Default Notice”) from certain investors (the “Investors”) with respect to a private placement transaction dated June 4, 2007 (the “Financing Transaction”), pursuant to which the Company issued 50,000 shares of common stock and 50,000 common stock warrants to the Investors. The Default Notice was made by the Investors due to the Company’s failure to fulfill its registration statement obligation under the Financing Transaction. The Default Notice demanded the issuance of 50,000 shares of the Company’s common stock as liquidated damages under the agreement. After due consideration and reasonable deliberation, the Company agreed to issue to each of the Investors 5,000 shares of the Company’s common stock, which represented a total of 50,000 shares. The shares of common stock were issued to the Investors in March and April 2009. In connection with its audited financial statements for the fiscal year ended September 30, 2009, the Company decided to restate its financial statements for the 2008 fiscal year end period and each quarter in 2009 fiscal year to reflect the issuance of these shares as liquidated damages. On February 1, 2009, the Company cancelled 1,000 shares returned from Her Village Limited pursuant to an Asset Transfer Agreement. In March and April 2009, the Company issued a total of 50,000 shares to certain investors as liquidated damages for its failure to meet its registration obligation under a financing transaction occurring in 2007. In May 2009, the Company issued 44,219 common shares of common stock and 7,782 warrants as consideration of the acquisition of GlobStream. At the same time, the Company cancelled the 12,000 common stock then held by GlobStream on acquisition. On July 9, 2009, the Company entered into an agreement with Redrock Capital Venture Limited which cancelled outstanding loans in the amount of $223,529 in favor of Redrock for the issuance of 92,683 shares of its common stock. On September 8, 2009, pursuant to the transaction with Beijing Hua Hui on August 1, 2009, the Company issued 832,318 shares of its common stock to Wise Gold Investment Ltd., a British Virgin Island company acting on behalf of Hua Hui. In addition, on that same date, it issued 1,942,074 shares of common stock to Blossom Grow Holdings Limited, a British Virgin Island company, as escrow agent under an escrow agreement by and among the Company, the escrow agent, and Hua Hui. On November 14, 2009, the Board of Directors resolved to return and retired the 500 treasury stock held by the Company. Effective on November 16, 2009, we effected a 20 for 1 reverse split of our issued and outstanding common stock. This reverse stock split already gave retroactive effect in the computation of basis and diluted EPS for all period presented accordingly. As of September 30, 2011 and 2010, the Company had 3,272,311 and 3,272,311 shares issued and outstanding respectively. On July 22, 2007, 60,000 common stock warrants were issued to Investors. Under the Warrant, the investors have the right, for a period of three years from the date of such warrant, to purchase a total of 60,000 shares of the Company’s common stock. The per share exercise price of the Warrant is $33. The warrants were expired on July 21, 2010. On July 4, 2008, pursuant to the Stock Purchase Agreement made and entered into by the Company and Her Village Limited, we issued warrants to the investor for the option to purchase 50,000 shares of Common Stock with an exercise price of $20 per share and an expiration date of 18 months from the date of issuance. Such warrants were expired on January 3, 2010. On June 28, 2009, pursuant to the Acquisition Agreement made and entered into by the Company and GlobStream, the Company issued warrants to Mr. Luo Wenjun for the option to purchase 7,782 shares of common stock with an exercise price of $3 per share and an expiration after March 23, 2019. These Warrants may be exercised, in whole or in part, by the Holder during the Exercise Period by (i) the presentation and surrender of this Warrant to the Company along with a duly executed Notice of Exercise specifying the number of Warrant Shares to be purchased, and (ii) delivery of payment to the Company of the Exercise Price for the number of Warrant Shares specified in the Notice of Exercise. As of September 30, 2011, the Company had 7,782 common stock warrants outstanding. In 2001, the Board of Directors adopted a Stock Plan (“Plan”). Under the terms and conditions of the Plan, the Board of Directors is empowered to grant stock options to employees, consultants, officers and directors of the Company. Additionally, the Board will determine at the time of granting the vesting provision and whether the options will be qualified as Incentive Stock Options under Section 422 of the Internal Revenue Code (Section 422 provides certain tax advantages to the employee recipients). The Plan was approved by the shareholders of the Company on September 15, 2001. The total number of shares of common stock available under the Plan may not exceed 100. As of September 30, 2011, no options were granted under the Plan. In 2004, certain shareholders, directors, and officers entered into an agreement to establish a fund wherein 32,500 shares of common stock would be returned by the shareholders to the Company for cancellation and reissuance as incentives to compensate new officers, directors and other management team members based on the management effort and performance decided by the three shareholders. On July 28, 2005, one of the shareholders returned 500 shares to the Company, which is treated as treasury stock at the face value and the premium as additional paid-in capital. The shares have been valued at a predecessor cost value of $0.02 per share and were held by the Company. On November 14, 2009, the Board of Directors resolved to return and retire these 500 shares. Rental expenses for the year ended September 30, 2011 and 2010 was $63,984 and $58,861 respectively. The following data show the amounts used in computing loss per share and the weighted average number of shares for the year ended September 30, 2011 and September 30, 2010. As the Company has a loss, presenting diluted net earnings (loss) per share is considered anti-dilutive and not included in the consolidated statement of operations. The entities within the Company file separate tax returns in the respective tax jurisdictions that they operate. Key Prosper Holdings Limited incorporated in the British Virgin Islands as exempted company is not subject to any income tax in the British Virgin Islands. SNMTS is generally subject to Hong Kong income tax on its taxable income derived from trade or businesses carried out in Hong Kong at 16.5% for the two years ended September 30, 2011 and 2010. However, as SNMTS has not generated any revenue or income, no provision for Hong Kong income tax has been made. As SNMTS has yet commenced operations, the expenses incurred are not deductible and no loss carry forward was thus resulted. CFCD established in the PRC was subject to the PRC Enterprise Income Tax (“EIT”) at 33% prior to January 1, 2008. The PRC Enterprise Income Tax Law, among other things, imposes a unified income tax rate of 25% for both domestic and foreign invested enterprises registered in the PRC. The New EIT Law provides a grandfathering on tax holidays which were granted under the then effective tax laws and regulations. The NEW EIT Law also imposes a withholding tax of 10% unless reduced by a tax treaty, for dividends distributed by a PRC-resident enterprise to its immediate holding company outside the PRC for earnings accumulated beginning on January 1, 2008 and undistributed earnings generated prior to January 1, 2008 are exempt from such withholding tax. As the PRC subsidiary is loss status, the Company has not provided for withholding taxes of its PRC subsidiary as of September 30, 2011 and 2010. According to the PRC Tax Administration and Collection Law, the statute of limitations is three years if the underpayment of taxes is due to computational or other errors made by the taxpayer or the withholding agent. The statute of limitations extends five years under special circumstances. In the case of transfer pricing issues, the statute of limitations is 10 years. There is no state of limitations in the case of tax evasions. Accordingly, the income tax returns of China Grand Resorts, Inc. for the years ended September 30, 2011 through 2010 are open to examination by the PRC state and local tax authorities. As of September 30, 2011 and 2010, the Company did not have any significant temporary differences and carry forwards that may result in deferred tax. The Company has analyzed the tax positions taken or expected to be taken in its tax filing and has concluded it has no material liability related to uncertain tax positions or unrecognized tax benefits. The Company does not anticipate any significant increases or decreases to its liability for unrecognized tax benefits within the next 12 months. On August 1, 2009, we entered into a subscription and asset sale agreement with Hua Hui. Under the terms of the Agreement, we received from Hua Hui the commercial income rights to 10,000 square meters to a 17 story apartment building in the Huadun Changde International Hotel’s Apartment Complex located in the city of Changde, Hunan Province (“Project”). The Project is currently under development by Hua Hui. In exchange, we agreed to issue to Hua Hui 2,774,392 shares of our common stock. As additional consideration, we transferred to Hua Hui all of our shares of the GlobStream Technology Inc., certain assets of both SNMTS and CFCD and certain assets of the Company. According to ASC 845-10-S99, transfers of non-monetary assets to a company by its promoters or shareholders in exchange for stock prior to or at the time of the entity’s initial public offering normally should be recorded at the transferors' historical cost basis determined under GAAP. In this transaction, Hua Hui became the controlling shareholder of the Company after it transferred the commercial income rights to the Company. Therefore, the accounting principles in ASC 845-10-S99 were followed and the Company recorded the rights at its historical cost basis, which was internally developed and had zero basis. According to ASC 845-10-30, the accounting for non-monetary transactions should be based on the fair values of the assets (or services) involved, which is the same basis as that used in monetary transactions. Thus, the cost of a non-monetary asset acquired in exchange for another non-monetary asset is the fair value of the asset surrendered to obtain it, and a gain or loss shall be recognized on the exchange. The fair value of the asset received shall be used to measure the cost if it is more clearly evident than the fair value of the asset surrendered. Similarly, a non-monetary asset received in a nonreciprocal transfer shall be recorded at the fair value of the asset received. A transfer of a non-monetary asset to a stockholder or to another entity in a nonreciprocal transfer shall be recorded at the fair value of the asset transferred and a gain or loss shall be recognized on the disposition of the asset. We recorded the disposal of the subsidiaries and assets at fair value. As the result of the transaction with Hua Hui, we experienced a loss on disposal of the above mentioned assets of $1,345,688 in fiscal year 2009. In accordance with Section 13 or 15(d) of the Exchange Act, the registrant caused this Annual Report to be signed on its behalf by the undersigned, thereunto duly authorized. Pursuant to the requirements of the Securities Exchange Act of 1934, this Annual Report has been signed below by the following persons on behalf of the registrant and in the capacities and on the dates indicated.